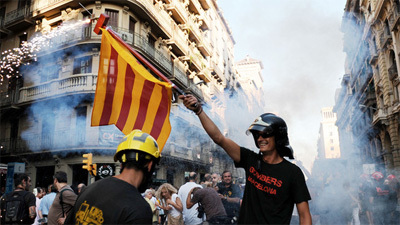 Catalonia will request an emergency €5bn credit line from Spain’s central government as the region struggles to refinance its debts, underscoring anxieties about the eurozone debt crisis a week before the European Central Bank is expected to unveil details of its revamped bond-buying programme. The government of Catalonia, which has debts of €42bn and manages an economy as large as Portugal’s, on Tuesday said it would request the aid from Spain’s regional bailout fund. The region has been locked out of capital markets and will become the second of Spain’s 17 autonomous regions to formally request aid from a €18bn government rescue fund.